With the fast-paced lifestyle that comes with today’s modern world, more and more people are looking for that ideal place to set their all-important meetings and conferences. I Hotel offers just that - a venue for corporate meetings and conventions with a relaxing ambiance. Set in the scenic island of Batam, Indonesia, I Hotel is an integrated hotel and apartment specially designed for daily and long-staying business travelers in mind. Fit for executives on the go, every room at I Hotel in Batam offers guests all the comfort they need while they are on business. Warm and inviting, the hotel boasts of 165 rooms, including suites and apartments equipped with modern amenities to ensure guests of a hassle-free stay. More spacious than other hotel rooms in Batam, accommodations at I Hotel exude warmth, comfort, and serenity. Whether they choose to stay in a Superior or Deluxe room, Suite or Studio Apartment, Executive or Deluxe apartment, guests are assured that their stay will be as relaxing and worry-free as possible. I Hotel in Batam also has 12 one-room apartments and three (3) deluxe apartments. And as part of its value-added service, the hotel also offers long-stay rates that guests can avail. With so many furnished rooms to choose from, there is no doubt that I Hotel is the best place for business travelers. Whatever’s your whim,ihotel has just the room to satisfy your need. Breakfast for 2 is valid for single and double occupancy. 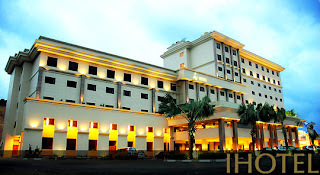 Providing a wide range of corporate venues for business executives is what makes I Hotel in Batam unique. Conference facilities, large ballroom, two (2) meeting rooms, and wireless hotspots within the hotel are some of the facilities and services that we offer.offer. I Hotel specializes in providing corporate venues for business travelers in town for meetings, conferences, or seminars. Two (2) meeting rooms equipped with the necessary facilities, as well as a ballroom with a capacity of 1,000 persons, are readily available for business guests to utilize. This charming new hotel also understands the need for relaxation after a busy day at work. That is why I Hotel Batam has provided a wide array of leisure and entertainment choices for guests to choose from. Taking a dip at the swimming pool, savoring the delicious food at the hotel’s two restaurants, or singing a tune or two at the karaoke lounge can be welcome distractions for business guests. We are proud to ensure you of your safety when staying at I Hotel, as we have installed state-of-the-art safety features, like smoke detectors, sprinklers and hydrants that are in compliance with international standards. You will also be able to use the lifts in case of emergencies, as all our lifts’ cables are fire-retardant. 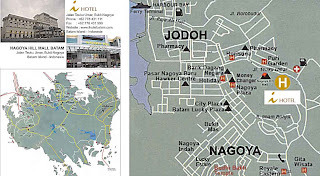 I Hotel is strategically located in the popular district of Nagoya in Batam, Indonesia. It is situated next to a brand new hypermarket and shopping center. The hotel is also near Nagoya Hill and a new ferry terminal in Batu Ampar. I Hotel is just six minutes away from the ferry terminal, 25 minutes from the international airport, 10 minutes from Batam Center, and 30 minutes from golf courses by car. This advantageous location makes the hotel the ideal choice for business guests.